The generalized second-grade fluids, which have been used for modeling the creep of ice and the flow of coal-water and coal-oil slurries, are among the simplest non-Newtonian fluid models that can describe shear-thinning/thickening and exhibit normal stress effects. 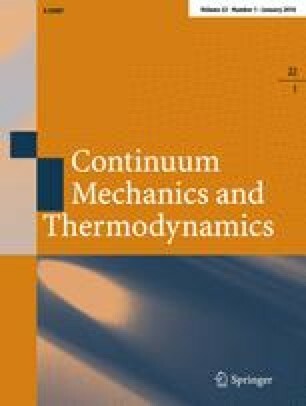 In this article, we conduct thermodynamic analysis on a class of generalized second-grade fluids, one distinguishing feature of which is the existence of a constitutive function Φ that describes frictional heating. We work within the framework of Serrin’s original formulation of neoclassical thermodynamics, where internal energy and entropy functions, if they exist for a continuous body at all, are to be derived from the classical First Law and (quantitatively reformulated) Second Law of thermodynamics for cycles. For the class of generalized second-grade fluids in question, we show from the First Law that an internal energy density u exists, and we derive the equation of energy balance; from the Second Law, we demonstrate the existence of an entropy density s and derive the Clausius–Duhem inequality that it satisfies. We obtain explicit expressions for u, s and the frictional heating Φ, and derive thermodynamic restrictions on the material functions of temperature μ, α 1, and α 2 that appear in the constitutive relation for the Cauchy stress. For the special case of second-grade fluids, our expressions for u and s agree with those which Dunn and Fosdick  derived under the theoretical framework of the rational thermodynamics of Coleman and Noll.